Herons are wading birds that are typically found in shallow waters of ponds, lakes, marshes and beaches, where they forage for food. Great Blue Herons, often called Blue Herons, are gray long-legged waders that live in Austin year-round. During winter the resident birds are joined by some northerners escaping the cold. 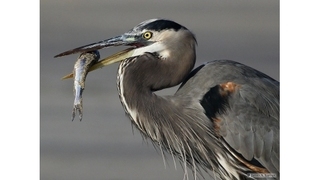 Great Blue Herons have had a rookery close to Red Bud Isle Park for several years, where several pairs nest colonially. They should begin to build their nests soon, high in the tall trees below the Tom Miller dam. Both parents will incubate the eggs and brood the young for several weeks. It is quite incongruous to see these 46 inch tall birds standing at their stick nests and tending their young. A much more elusive heron in the Austin area is the Black-crowned Night Heron. They winter in Austin in very small numbers and are found intermittently during the breeding season. Where the Great Blue is long-legged and long-necked, the Black-crowned is short-necked, stocky and short-legged. It often tucks its neck in, which makes it look hunch-backed. During the day it perches hidden among leaves and branches at water’s edge, coming out at dusk and night to feed, true to its name. The adult Black-crowned Night Heron does indeed have a black crown. It also has a black back, gray wings and a white breast and belly. Its legs are yellow except at the height of breeding when they turn bright pink! Good places to look for roosting Black-crowned Night Herons are along Lady Bird Lake’s Holly Shores and below Longhorn Dam at Pleasant Valley Road in Roy Guerrero Park. Cliff Swallows are expected by the end of February. When Cliff Swallows return they will take a few weeks to refurbish old nests, and then get down to the business of raising young in mid-March. The highway and bridge underpasses, where they make their mud nests, will be teeming with life once again. Travis Audubon Events — Beginners welcome. Check the Travis Audubon website calendar and field trip pages for details. February is brimming with birding activities: a monthly meeting, local and out-of-town bird walks and field trips, classes and youth birding activities. You still have the opportunity to enjoy wintering birds before they head north. Travis Audubon Monthly Meeting Join us for the February 21 meeting featuring Jan Wrede and Rufus Stephens. Their topic: Attracting Birds to the Hill Country. New location: First Unitarian Universalist Church Sanctuary, 4700 Grover Ave, Austin, TX 78756 at 7:00 p.m.
Commons Ford Metropolitan Park Bird Walk February 10, 7:30 a.m. – 11:30 a.m. Take a walk around the restored forty acre prairie and enjoy wintering birds while getting some exercise. Registration required. Hornsby Bend Monthly Bird Walk February 16, 7:30 a.m. 2210 FM973, Austin, TX. Hornsby is located just a little northeast of the airport off Hwy 71. Join us to explore Austin’s premier birding site. All levels of birders are welcome and no registration is required. Meet in front of the Center for Environmental Research. Wear closed toe shoes or boots and dress for the weather. Birdability: Northern District Walnut Creek Trail in Walnut Creek Metropolitan Park February 16, 8:00 a.m.
Join Virginia Rose for a bird walk tailor-made for folks with mobility challenges. Young Birders Club has two bird walks in February. Feb. 16 will feature a walk at McKinney Roughs Nature Park east of Austin. On February 24, the walk will be held at Yett Creek Neighborhood Park in near Northwest Austin. Both require registration. This group is geared for youth 8 years and up. A parent or guardian is expected to attend the walk. February 23, 12:00 – 2:30 p.m. Imagine slamming your face into a brick wall going 16 miles per hour. This self-destructive act would require about 1,200 g of force. Yet, a Pileated Woodpecker exerts the same force up to 20 times per second, and as many as 12,000 times per day, pounding its head into trees! How does it do this without getting concussions or retinal hemorrhages?! Woodpeckers possess a suite of adaptations that makes them one of the most specialized bird families in the world. Each species’ anatomy perfectly suits its unique lifestyle, with different woodpecker species possessing adaptations for aerial acrobatics, for drilling sap wells, or for extracting ants from underground burrows. Join North American woodpecker specialist Stephen Shunk as we dive into the amazing world of woodpecker specialization. Fee and registration required. April has been a very wet month across much of the KXAN viewing area. The Austin has picked up 4-8 inches of rain this month, saturating the ground, and leading to a higher risk of flash flooding if more heavy rain falls this week. Area residents should be on heightened alert for the possibility of flooded low water crossings if heavy rain falls Wednesday. Residents of Hays County and the Dripping Springs area can attend the National Weather Service FloodAware training Tuesday night. Details below. What's the state of bees in Texas?